Home Celebrities Jon Brower Minnoch – Bio, Wife, Weight Loss, How Did He Die? In the world we live in, many people, both men and women, seek to be famous through different means and to have their names written in the history books. However, only a handful of people are able to reach this desired goal. While several people strive to get famous through their accomplishments on planet earth, there are also another set of people who by no making of theirs are thrown into the global spotlight whether positively or negatively. This is the story of American-born man Jon Brower Minnoch. Minnoch holds the record for the heaviest human being to have ever walked the earth at a peak weight of well over 600kg. His extreme weight made daily living very difficult for him and consequently, he sought medical means to reduce his weight. He was able to shed more than half of his body weight and in the process, he set another world record, for the highest human weight loss ever recorded. Sadly, he died in the early 1980s but more than 3 decades after his death, he still holds the record of the heaviest man to have ever lived. Jon Brower Minnoch was born on the 30th of September 1941. He was born in the city of Bainbridge Island in Kitsap County, Washington. There is not much information known about his early life but he is said to have attained the weight of 133 kg (294 lb; 21.0 stone) by the time he was only 12 years old. Ten years later, when he was 22 years old, he had reached 230 kg (500 lb; 36 stone). He is said to have worked as a taxi driver as a young adult before his battle with obesity prevented him from carrying out his daily activities. Minnoch’s weight remained at a steady increase until March 1978 when he was hospitalised for cardiac and respiratory failure. He was 36 years old at the time and he was equally diagnosed with massive generalized oedema, an abnormal accumulation of extracellular fluid in the body. While he was at the hospital, Dr. Robert Schwartz, a consultant endocrinologist, estimated that the greater percentage of Minnoch’s body mass, about 408 kg (900 lb), was made up of accumulated fluid resulting from congestive heart failure. In addition to several health challenges, Jon Brower Minnoch found it very difficult to move about owing to his extreme weight. It took over 12 firemen and rescue workers aided by a specially-crafted stretcher to get him to the University of Washington Medical Center in Seattle. There, he was placed on two hospital beds joined together and it took about 13 able-bodied workers to turn him over for a change of sheet or cleaning. Minnoch spent about 16 months during his first major hospitalization. Having been placed on a strict diet, he lost approximately 419 kg (924 lb; 66 st), the highest weight loss ever recorded in a human, and his weight was drastically reduced to 216 kg (476 lb; 34 st). Apparently, the figures associated with Minnoch’s weight were all estimated values as he was unable to get on a scale due to his extreme size, a lack of mobility as well as his deteriorating health. However, his full adult height was measured to be 6 feet 1 inch (185 cm). Jon Brower Minnoch was married to a woman named Jeannette. The duo tied the knot in 1978 and by so doing, they made history as the couple with the greatest weight difference; Jon at 640 kg (1400 lb) and Jeanette at 50 kg (110 lb). Their union lasted for about 5 years and they had two children together. Minnoch ended his first major hospitalization in 1979 after shedding an astonishing 419 kg (724 lb) during a 16-month spell. Sadly, his weight began to increase after he was discharged and after about a year, he was readmitted to the hospital. 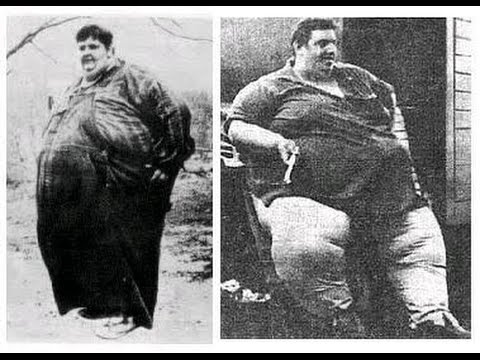 His body weight had hit 432 kg (952 lb; 68 st) by the time he was rehospitalized in October 1981. Upon this second hospitalization, a decision was taken to discontinue the management of Minnoch’s weight problems as the underlying oedema was found to be incurable and almost impossible to treat. He lived for another 23 months and eventually gave up the ghost on September 10, 1983.